Parto! 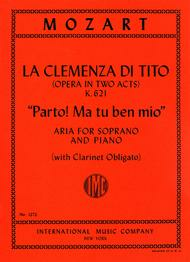 Ma tu ben mio, from 'La Clemenza di Tito' (for Soprano with B flat clarinet ad lib.) composed by Wolfgang Amadeus Mozart (1756-1791). Edited by Sergius Kagen. For Soprano voice with B flat clarinet ad lib. (with clarinet ad lib.). Language: Italian and English. Published by International Music Company (IM.1272).With Language: Italian and English.